For decades, huge expanses of land at the higher latitudes, which sit atop frozen soil – referred to as permafrost – have been thawing. When the subterranean ice in the permafrost melts, massive quantities of greenhouse gases can be released into the atmosphere, intensifying global warming. Located at the heart of the Siberian tundra, the Samoylov research station looms like the last outpost of civilization. It offers researchers ideal conditions for studying permafrost soils in the Lena Delta – either near the station itself, or on the surrounding islands. The clock is ticking for Muostakh Island: another 100, 140, maybe even 200 years, then the small isle off the coast of Siberia will disappear from the map. Then, where today 15-metre-tall bluffs of ice-rich, frozen ground still defy the currents of the Lena River and the waves of the Laptev Sea, there will be nothing left. How thick is the old ground ice? Satellite images help scientists to investigate changes in remote permafrost regions. The stories about permafrost provide a whole new perspective on the Arctic. Download for free! Animation: Permafrost – what is it? Herschel Island: a remote location covered with the lichens, mosses and grasses of the tundra, bordered by steep and eroding cliffs, and characterised by temperatures that only crawl above freezing between June and September – but for AWI researcher Hugues Lantuit and the team from his Young Investigators Group COPER (which stands for Coastal Permafrost Prosion, Organic Carbon and Nutrient Release in the Arctic Nearshore Zone), it’s the ideal field laboratory. Lantuit and his team want to determine how fast the permafrost is thawing on the island, a process causing entire stretches of coast to crumble and fill the surrounding Beaufort Sea with the carbon and nutrients that had become trapped in the soil over the millennia. Since 2006, Lantuit has travelled summer after summer to the island, which is located at the northernmost tip of Canada’s Yukon Territory, and has been accompanied by his COPER Team since 2012. 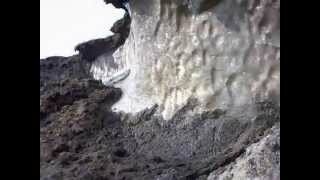 How much carbon is stored in the permafrost? Experts estimate that the frozen ground contains somewhere between 1300 and 1600 billion tonnes of carbon. Our entire atmosphere, for comparison, currently contains about 800 billion tonnes of carbon. The permafrost carbon was produced by animal and vegetable matter that has been locked inside the Earth for thousands of years. Though the majority of the carbon can be found in the upper soil layers, there are also unknown quantities of carbon stored in the submarine permafrost - having first formed on land during the last ice age, this permafrost was covered by the rising seas when that age came to an end, and is now under the ocean floor. To what extent will thawing permafrost intensify climate change? When permafrost thaws, bacteria and microorganisms will begin breaking down the plant and animal organic matter it contains. As a result, carbon dioxide or methane will be released, depending on how dry or wet the soil remains. Though methane only makes up two per cent of the greenhouse gases released, it's a highly potent gas; its global warming potential over a 100-year time frame is nearly 25 times higher than that of carbon dioxide. It was previously assumed that permafrost regions are carbon sinks. But there currently are only a few long-term measurement series that examine the carbon balance in permafrost regions year-round. One is from the AWI's Bayelva Permafrost Station near Ny-Ålesund (Svalbard); another is from Alaska. The readings in Alaska confirm that the area surveyed is a carbon sink. However, those from the Svalbard site show an annual carbon balance of about zero. In other words, here we see an equilibrium between the absorption of carbon by vegetation during the summer and the long "winter outgassing", during which microorganisms break down the carbon beneath the snows. With the help of models, researchers now estimate that if global warming continues unabated, the greenhouse gas emissions from permafrost, disregarding all other sources, could produce an additional temperature increase of up to 0.29 degrees Celsius by the end of the century, and of up to 0.40 degrees by 2300. Will the tundra become greener if temperatures continue to rise? If temperatures rise in the Arctic, it will stimulate plant growth and fixation of carbon in organic matter, initially counteracting the greenhouse gas emissions from the permafrost soils. However, in the long term and in the face of continually rising temperatures, the emissions produced by microbial decomposition will surpass the plant’s ability to absorb carbon dioxide. The thawing processes aren’t linear. For example in Ny-Ålesund, where measurements of permafrost temperatures have been taken since 1998, AWI researchers have observed an intensive thawing process that has increased the active thaw layer by 50 centimetres. Farther down, however, the permafrost temperatures remain largely unchanged. In contrast, in the Lena Delta not only has the thaw layer moved deeper, the underlying permafrost is also rapidly warming – by more than 1.5 degrees Celsius since 2006 (recorded at a depth of ten metres). Why are permafrost coasts increasingly crumbling? Coastal erosion in the Arctic has intensified over the past several decades as a result of dwindling sea-ice cover on the Arctic Ocean during the summer, higher water temperatures and rising sea levels. When there is less sea ice, storms can produce larger waves that gnaw away rapidly at the permafrost shores along the Arctic Ocean from June to October. On average the Arctic coastline recedes by circa half a metre per year, however, individual coasts that consist of ice-cemented permafrost sediments retreat with up to 25 metres per year. These rapid changes have major effects on ecosystems on or near the coast and their populaces, primarily through loss of land and the influx of sediment and nutrients in the water. The permafrost is rapidly receding, especially in the European part of the Russian Arctic. Between 1995 and 2005, the southern boundary of the regions with continuous permafrost, i.e. of those areas where at least 90 per cent of the landscape is underlain by permafrost, receded by up to 50 kilometres; in those with discontinuous permafrost, where the number lies between 10 and 90 per cent, the boundary receded by as much as 80 kilometres. Two time lapse movies from geoscientist Dr Julia Boike. The first one impressively shows how permafrost in the Arctic thaws. In the summer of 2012 scientists from the Alfred Wegener Institute had placed an automatic camera on the Eastern shore of the river Lena on the Samoylov island. Every four hours the camera took a picture over the course of 10 days and captured how the frozen ground retreats. 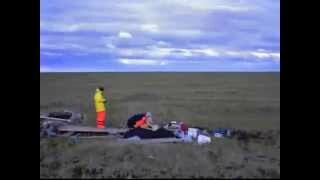 The second movie shows how scientists build a soil station in the Arctic permafrost. For this they installed sensors, which will tell them what happens underneath the surface. A team of scientists and engineers from AWI and GEOMAR started on an expedition to the Canadian Arctic to investigate thawing permafrost. Read their reports! Permafrost makes up a quarter of the landmass in the Northern Hemisphere. A large EU project, coordinated by the Alfred Wegener Institute, is now exploring the consequences for the global climate and for the people living in the Arctic. But that’s not all: working together with residents of the Arctic region, the researchers will also co-design strategies for the future in order to cope with ongoing climate change.